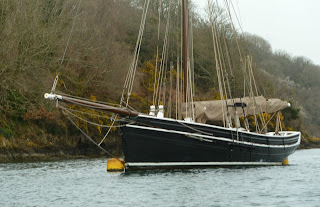 So far the bank holiday weekend has been cold, overcast, threatening rain and blowing 25 to 30 knots. Ever the optimist I decided to check out a few of the local weather stations to see if there was any prospect of it improving for a late afternoon sail. Down at Hurst Castle maximum gusts were up at 34 knots, closer to home Netley Sailing Club were showing gusts of 27-29.5 knots. 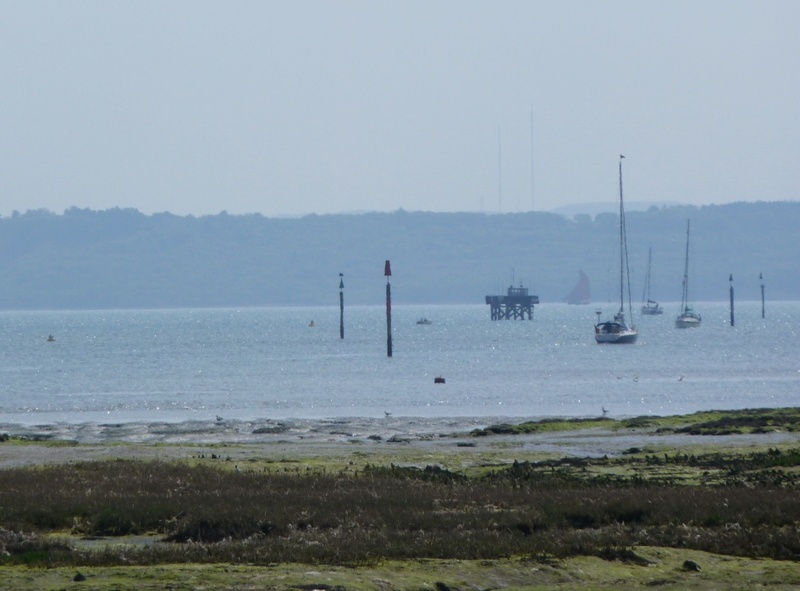 As a last effort I went over to Solent Web Cam over at AIS Live where Tony tracks shipping movements on a google earth type image and has a web cam pointing from Ryde of the Isle of Wight across the Solent towards Stokes Bay. Instead of seeing a few yachts and white caps, the view is obscured by an aircraft carrier, the George W Bush, not doubt there as part of the President's visit. 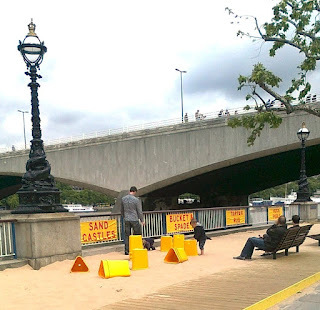 Now I remember reading something about Mr Obama being asked to pay the London Congestion charge for his motorcade which got me wondering of one of our local harbour masters had been out to collect overnight fees for anchoring? The Royal Lymington YC held their Classics & Gaffers Regatta last weekend. 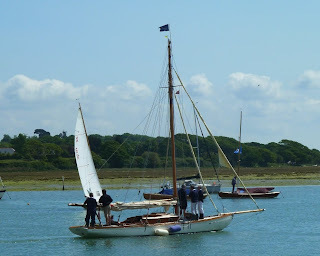 We had planned to take "Tosh" our cat boat over to sail out and watch the racing, but after a long week at work Saturday morning was a slow start, and then we stopped off for breakfast and then Joe went to play on the swings.... Fortunately we were there in time to see some of the fleet making their way out of the river. 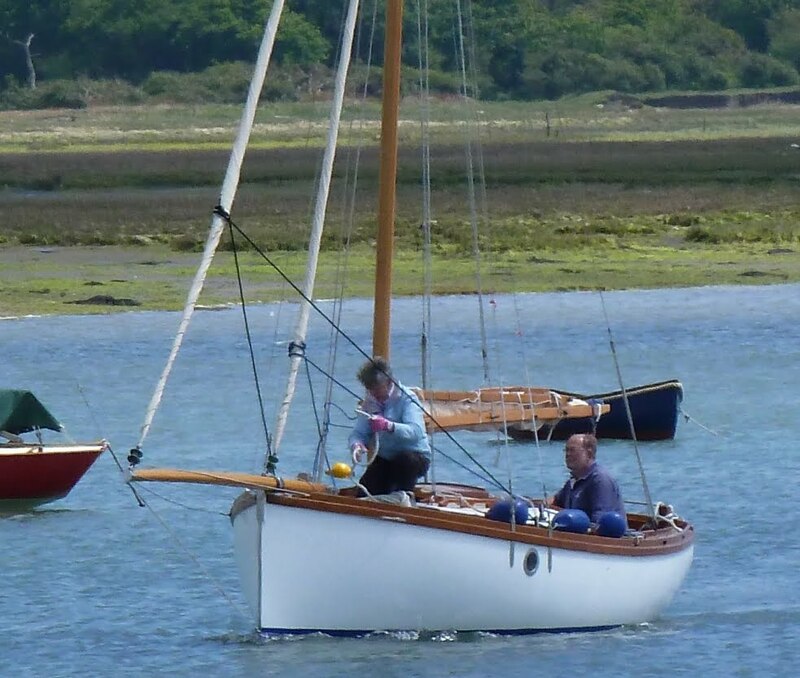 Some of the local XOD fleet were joining in, here No 16 sails off her mooring in near perfect conditions. 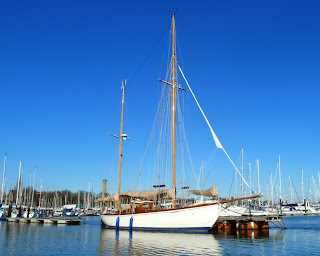 A local boat which I recognise but can't for the life of me remember what she's called or what her history is. Above another Lymington boat who's looks disguise her age, she's actually a modern design, built as a one off with a lifting bulb keel and fast, modern hull shape. 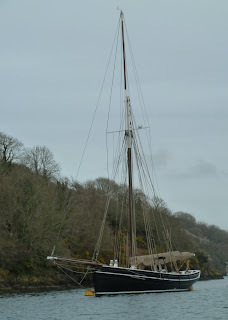 Just look at that top mast. 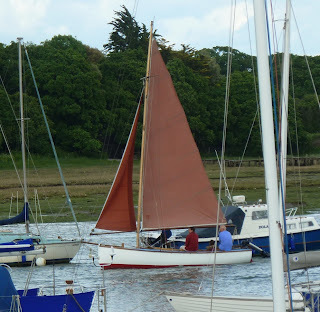 This delightful day racer was getting a tow away from the moorings adjacent the RLYC club house. 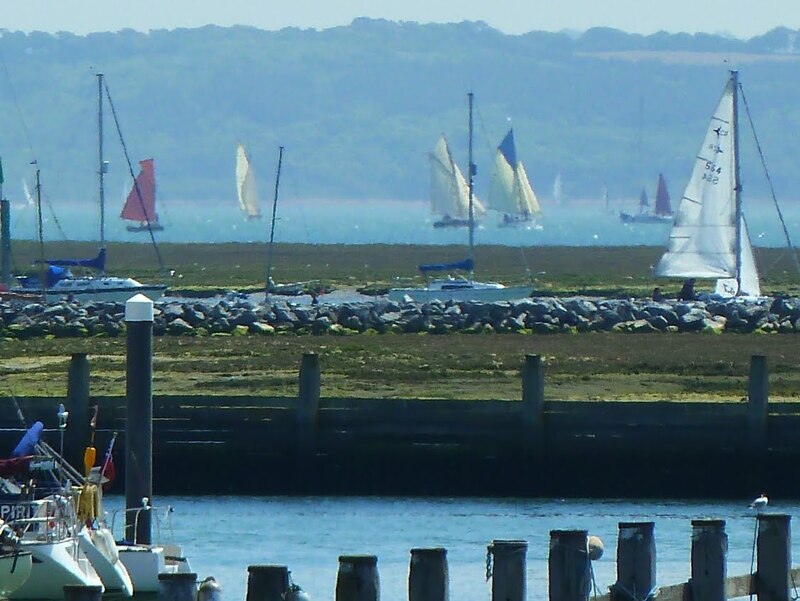 All the best action took place out in the Solent where a sea breeze had got up, sadly the racing was a bit far away to see even from the balcony at Lymington Town Sailing Club. I don't know if this boat was racing, but she's certainly pretty and either immaculately restored or a new build. And while we were watching all the other classics Sailfish went past under full canvass. 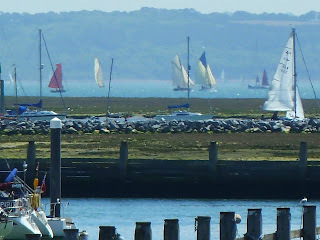 There are some great pictures of the racing on the RLYC site. 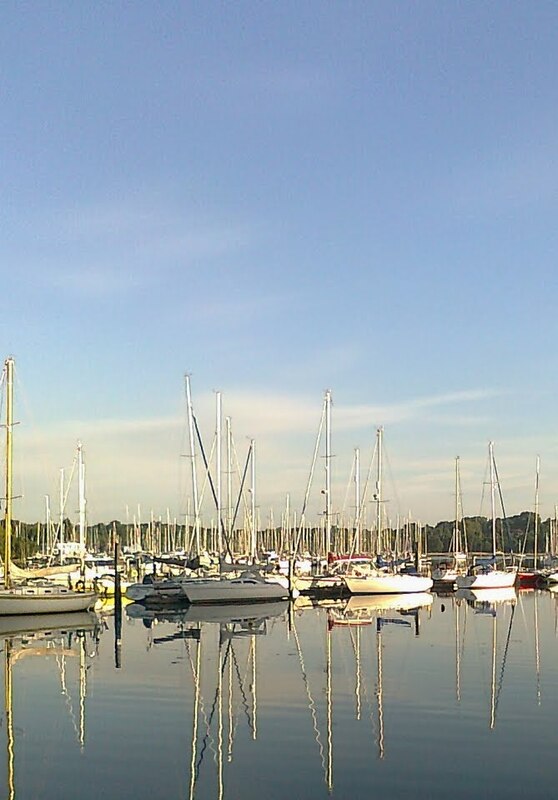 It was a perfect still morning today, the river was flat calm with a surface like glass, as I went out for my run. It was only when I looked up that I realised that the sky was clear as well, not an aeroplane, not a vapour trail to be seen. 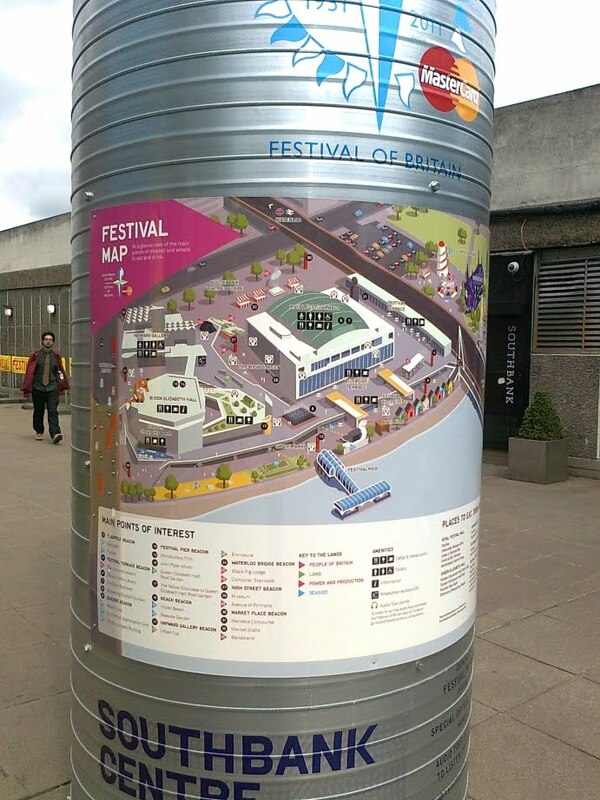 South Bank is celebrating the 60th Anniversary of the Festival of Britain. Normally I'm too preoccupied with work to pay much attention to what's going on outside, but last week it was lunch time so I decided to walk back from a meeting in the City and strolled along the South Bank where a whole host of events and installations are marking the event. 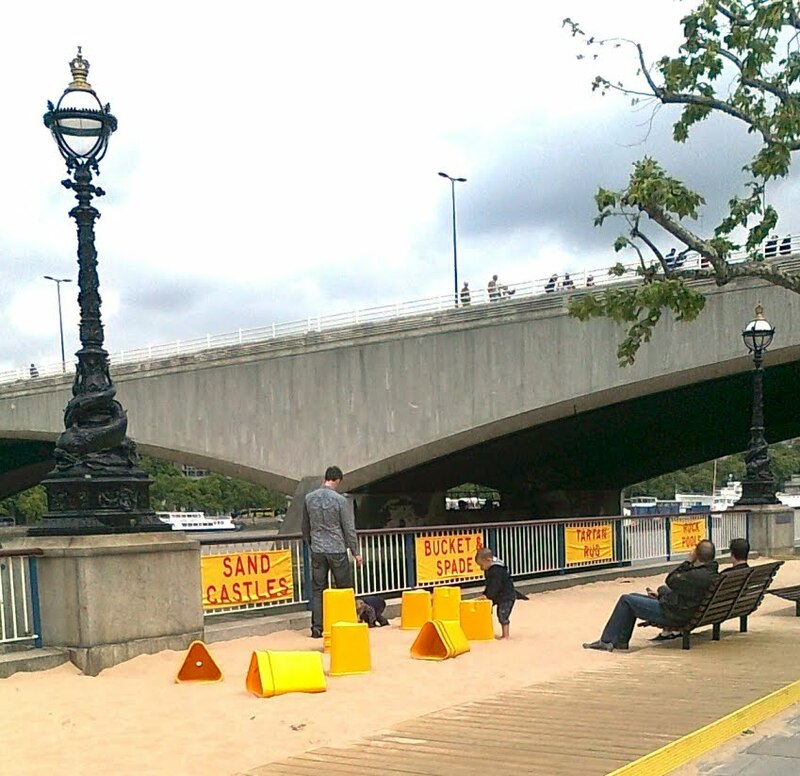 First thing to catch my attention is the beach that's been installed along the Thames, a few children had brought along buckets and spades. There was even an interesting boat drawn up on the makeshift beach. 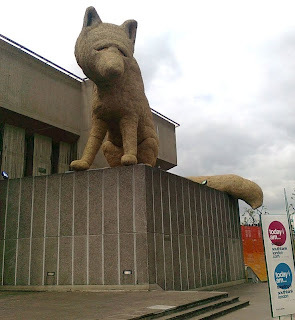 Up on the Festival Hall there was a giant fox which appeared to be made of straw. 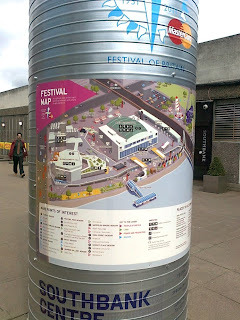 All in all a nice distraction during my lunchtime stroll, and then back to work. Walking through the park in Lymington last week I noticed a boat short tacking through the crowded moorings and snapped a couple of pictures even though it was difficult to get a clear view. 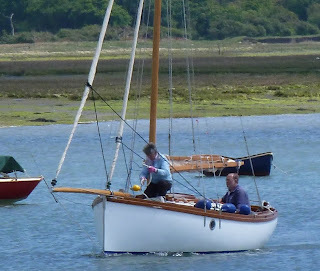 It was only when I got home and looked through the pictures that I realised it was the same classic day boat which I'd posted about last year. I wonder if I'm possibly becoming a boat stalker? 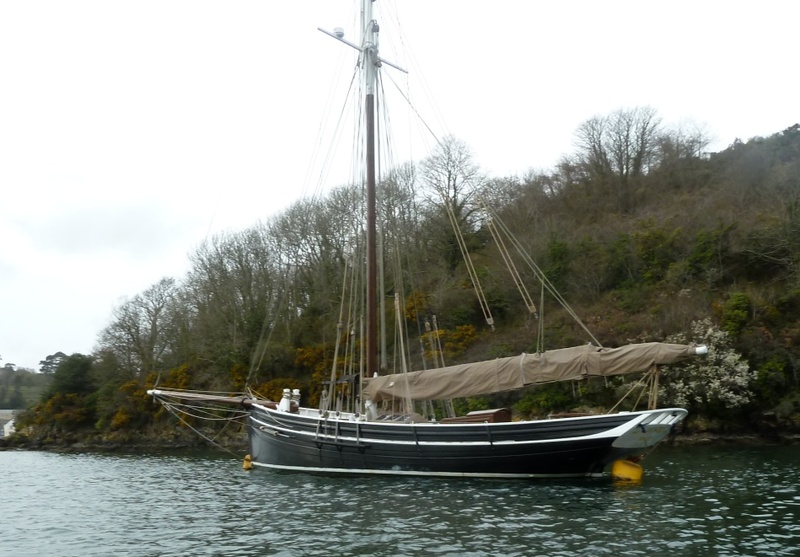 Following my previous post I received an email from David and Marc, members of the family who own her, "Sailfish is a classic. 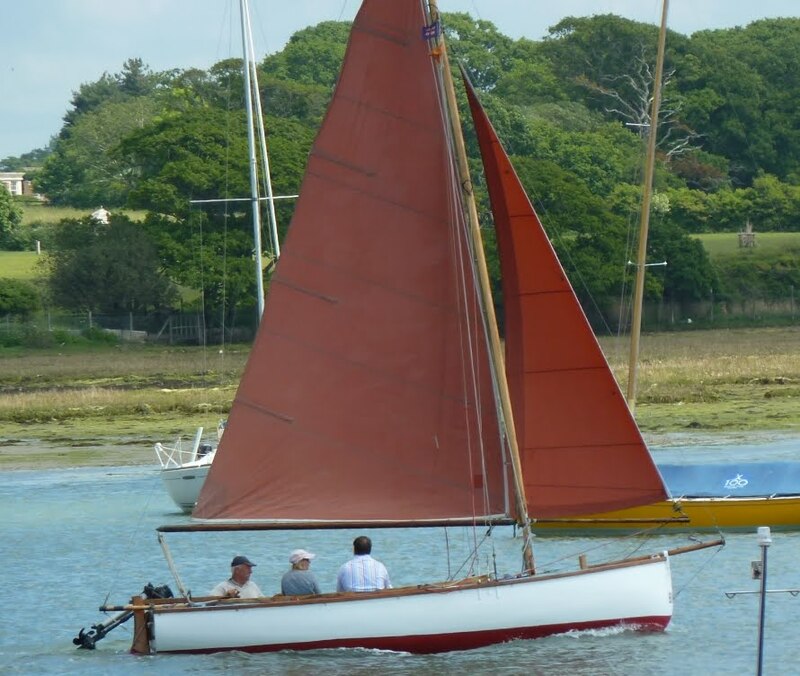 Designed and built locally by the Smith Brothers at Yarmouth Quay, sole survivor in its original state and one of 5 built specifically for the area. 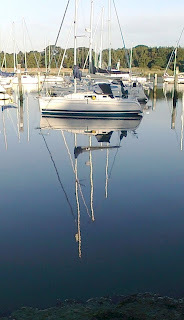 She has a lifting plate from 6 ft to 18", roller jib on goose-wing boom that allows the jib to be held out for following winds. 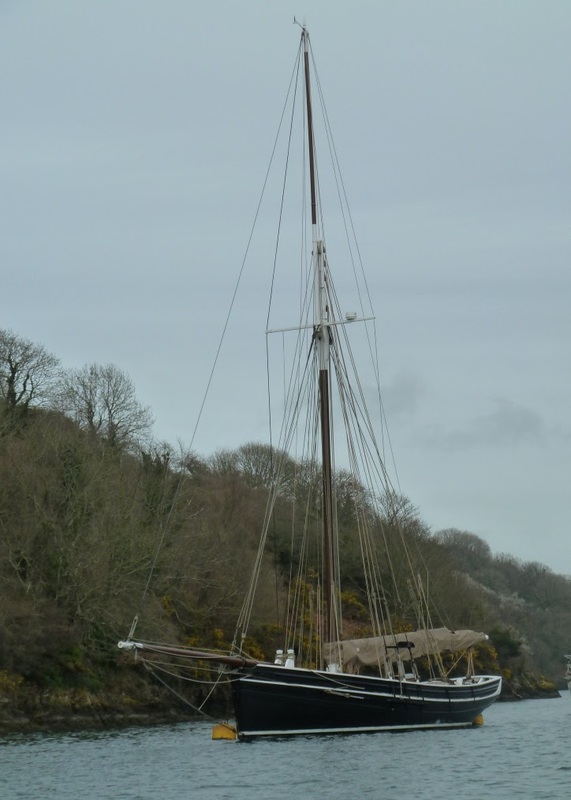 When built she had one of the first unique roll boom reefing systems fitted for the main sheet. 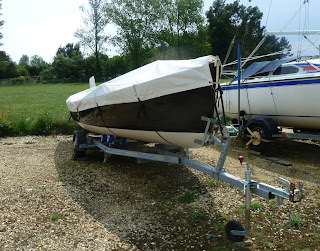 Sails were canvas and the seagull outboards were classics too (with manual!!). 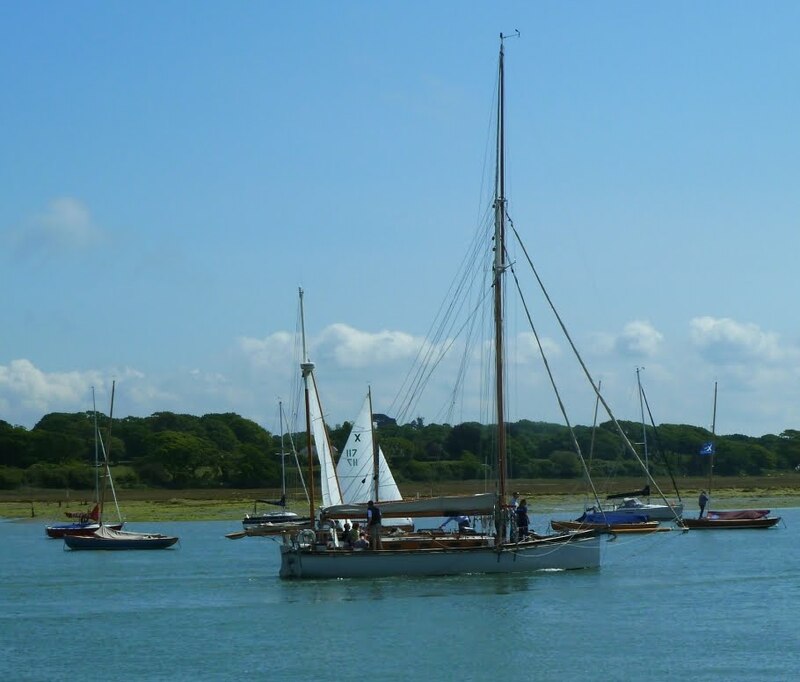 She has been moored in the same upper reaches of Lymington river for over 60 years and over 5 generations of family have sailed off the mooring at the town Quay, regularly summer and winter and Christmas day most years!" 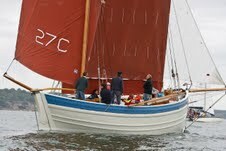 Marc also suggested that I might be invited out for a sail - which would be very welcome. 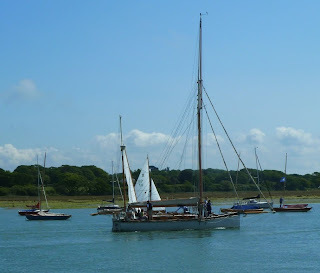 Ocean Pearl the Chichester based lugger appeared on 1001 Boats a few days ago, by co incidence someone sent me a picture of her in the 2009 Around the Island Race, hopefully we will see her competing in this year's 80th anniversary race as well. 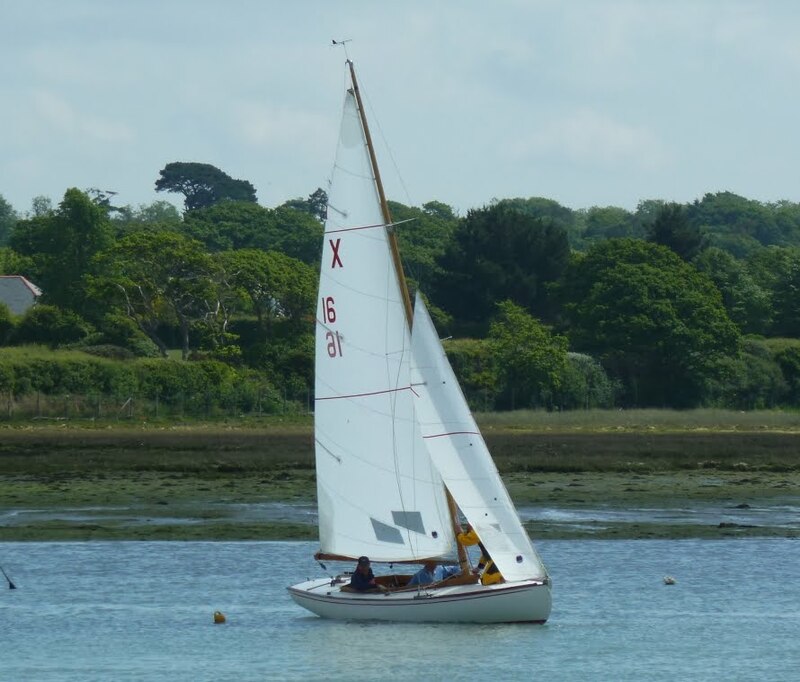 Another entry in the Gaffer class for othe 80th Anniversary Race and which was featured on the Bursledon Blog is MAYBIRD. 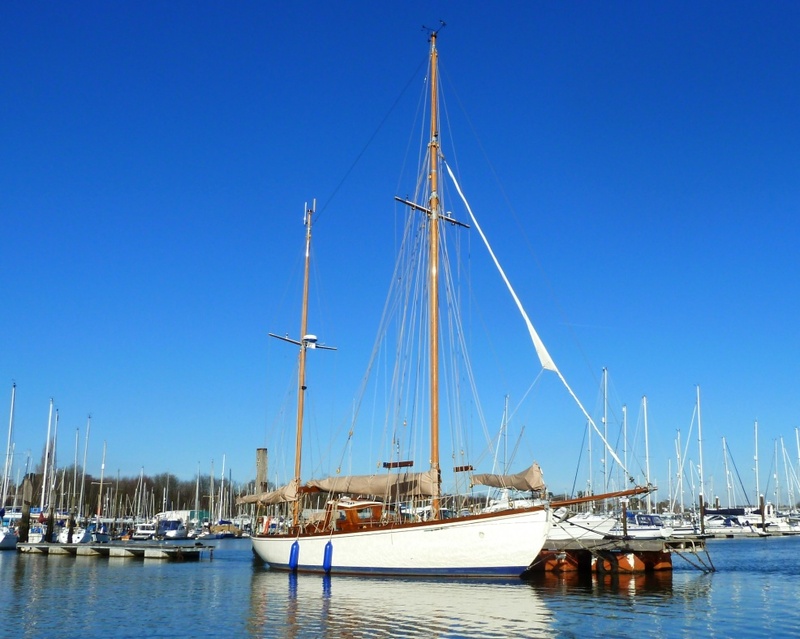 The Fred Shepherd Classic 43ft Gaff Rigged Ketch was built in 1937 and is in stunning condition having recently undergone a three-year restoration. 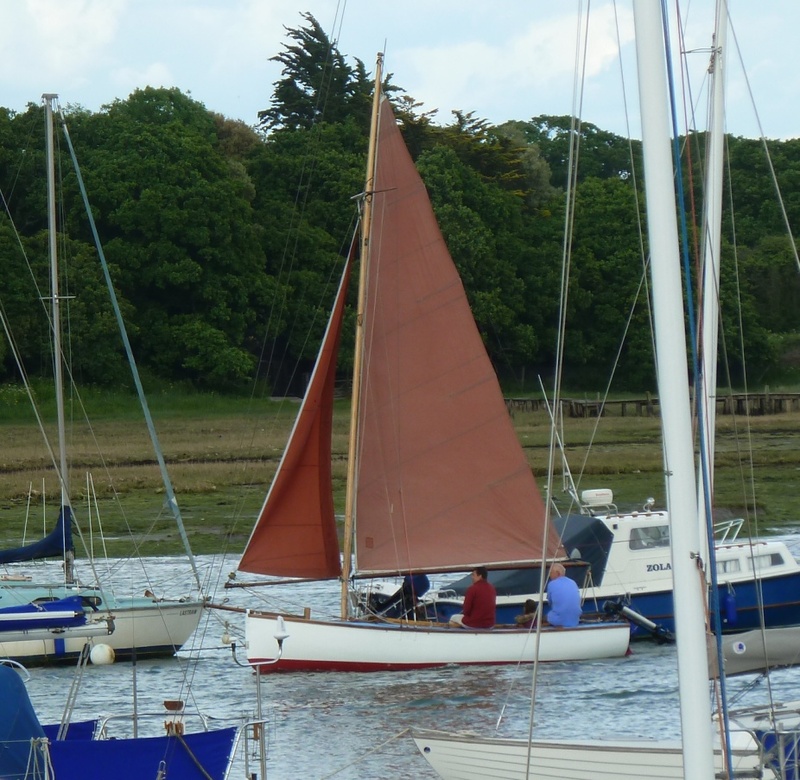 Previously owned by Rear Commodore of Royal Yacht Squadron John Russell before departing to New Zealand for 35 years she is back on the Hamble. 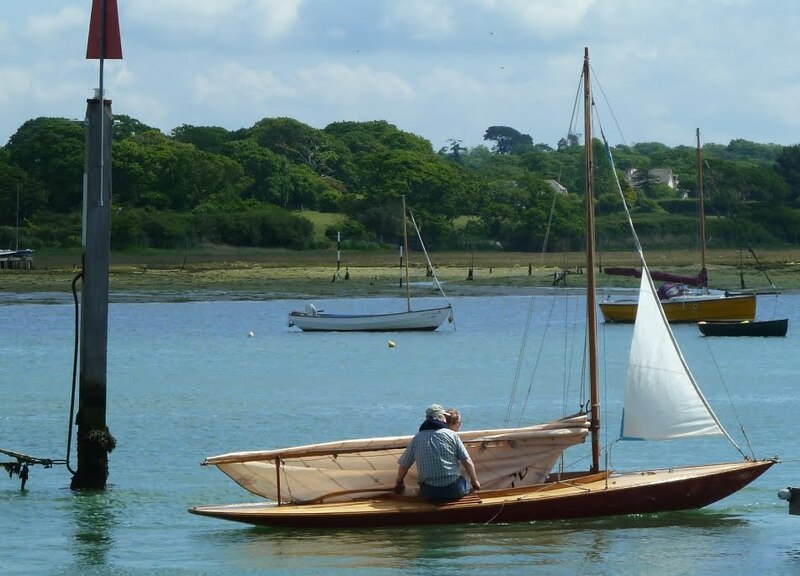 There are 30 gaffers currently entered for this year's race among them 6 Cornish Shrimpers, an original Itchen Ferry Nellie, built by Dan Hatcher in 1862, but perhaps my favourite is the Drascombe Drifter delightfully named "Creeky Crawley". 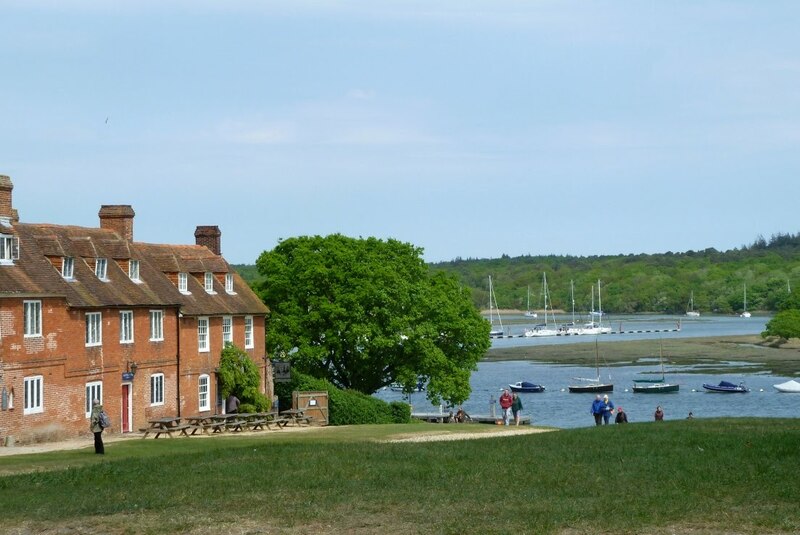 The walk from Beaulieu in the New Forest National Park down to Buckler's Hard follows the unspoiled, wooded river which is also home to some very interesting boats. 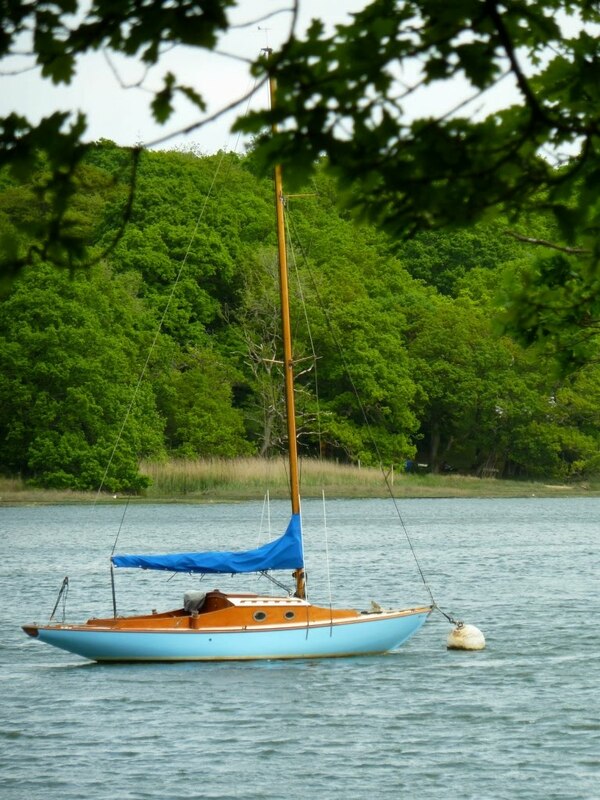 This delightful sloop looks to have been built between the wars as a performance cruiser. 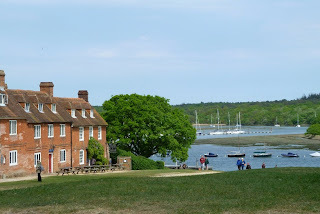 A great place to stop and rest is Buckler's Hard, the Georgian Hamlet is largely preserved as it was in the day when ships for Nelson's Navy were built there, although the web cam (see Bucker's Hard link) is relatively new. It's also a yachting center and while walking around the trailer sailor park we spotted this interesting boat, clearly new with a bright shiny brass stem band. Just visible under the cover are wooden spars which suggest a traditional rig, but the hull although tradition in many ways clearly has many modern touches including that high aspect rudder. Sadly there were no identification marks so it remains a mystery boat about which I'd like to know more. 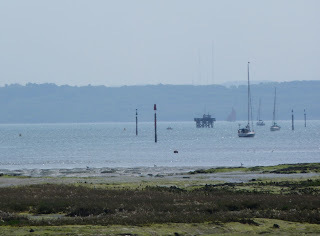 Walking westwards from Lymington, through the saltings past Oxey Lake there are fantastic views of the western Solent. 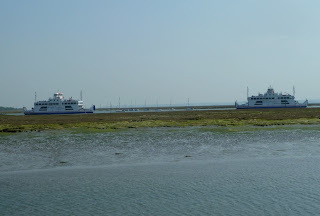 There are extensive shoals to both the east and west of the river entrance, but for incoming boats the entrance channel is well marked to starboard by the starting platform seen here and a "Jack in the Basket" to port. 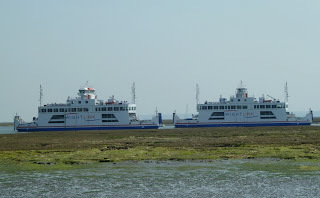 In the distance the Isle of Wight slopes westward towards Yarmouth, where a regular ferry service runs across the Solent to Lymington. 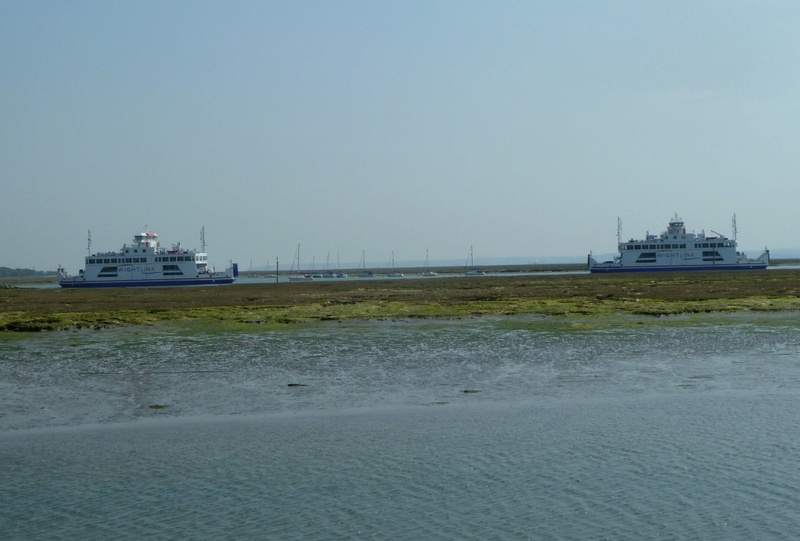 For some reason the outgoing and incoming ferries time their passage so that they always cross at the same point, a bend in the Lymington river. 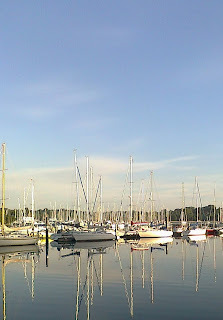 There is actually plenty of space, even though from the deck of a small yacht in the river it may not seem so, from a distance it looks very tight! 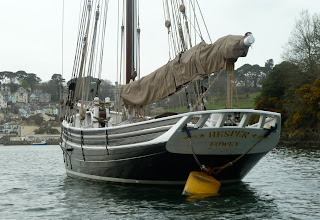 I've seen Hesper afloat on her mooring in Pill Creek, Fowey from the shore many times, but it was nice to have the opportunity to row past and get a close up view recently. The 44 foot pilot cutter was built in the west country by Working Sail and launched in 2004, one of a series of traditionally built pilot cutters. 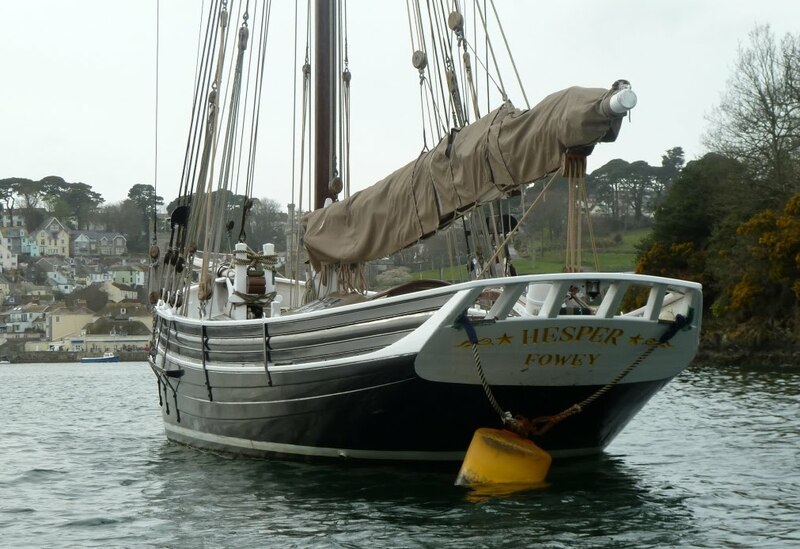 Despite her size Hesper has been set up so that she can be sailed two handed, which is how the pilot cutters of old were often worked. According to Working Sail also shares the excellent sea keeping qualities which made pilot cutters legendary craft they are. 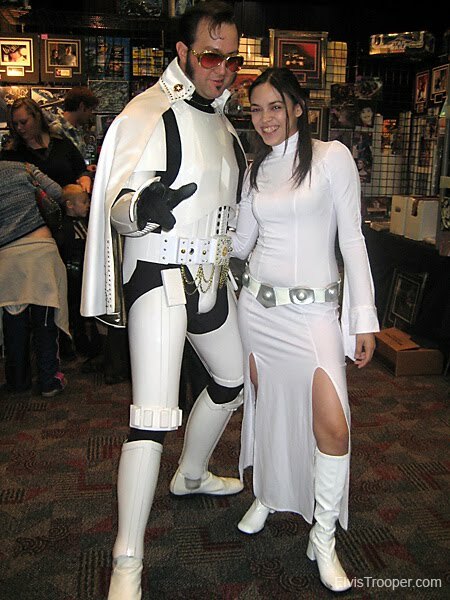 I guess we should give her a place on 1001 Boats, she is lovely. 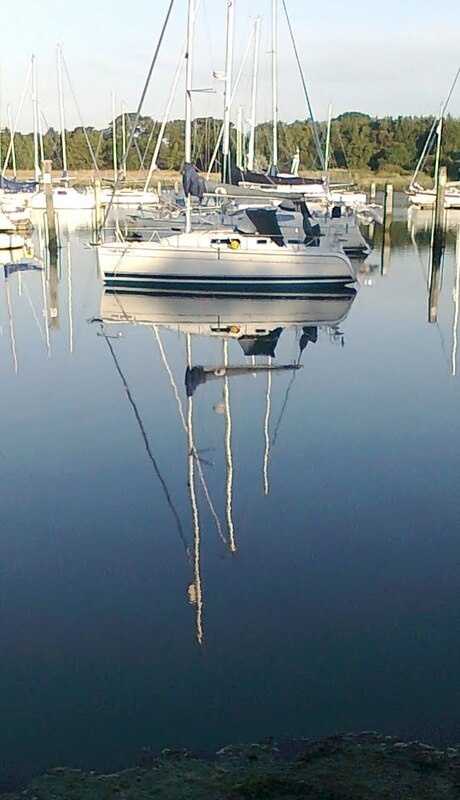 Is there a sailing boat in there? 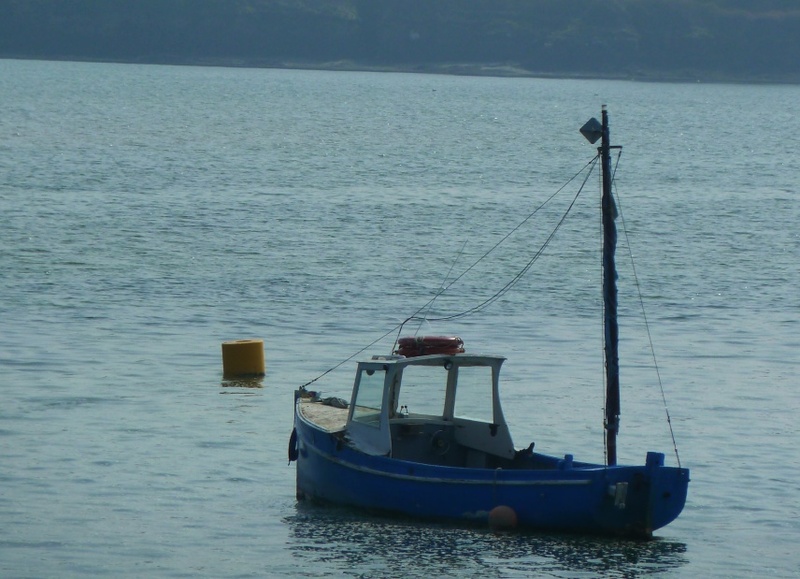 This motor boat on a mooring in the Camel estuary got me wondering how much was original and what her history was? The sheer line and the raised cabin don't match very well, so the latter may have been added sometime after the boat was built. 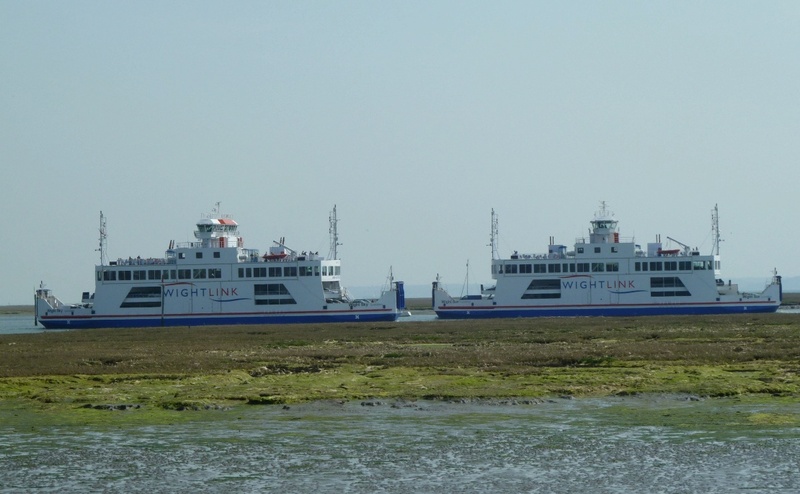 Then assuming the hull below the sheer is original, she was probably built as an open boat, which begs the question was she built as a motor boat? 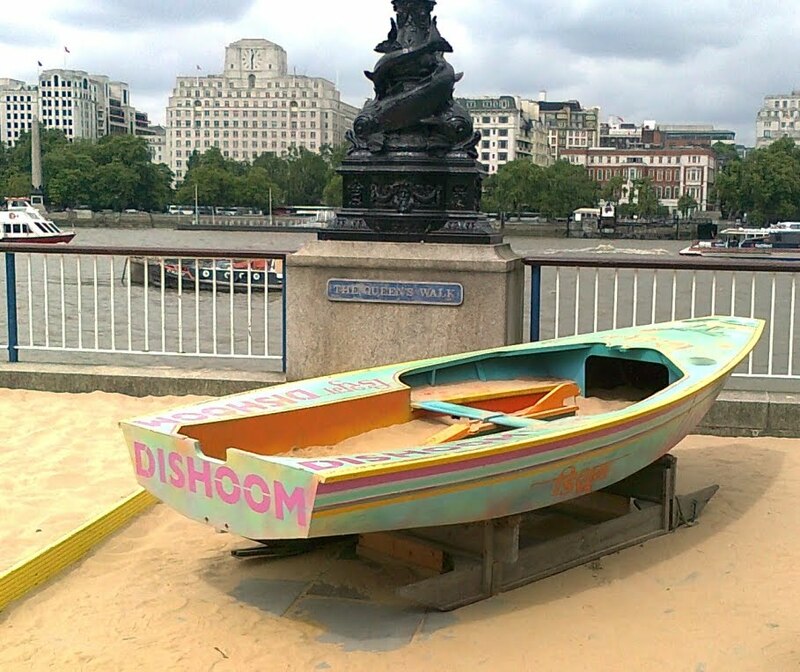 Possibly she was based on an older local boat with which builders were familiar. Many would have been built by eye and experience. It could equally be that this originally was a sailing boat, converted to engine power and latterly with the addition of the cabin and wheel house. Perhaps she originally was a Tosher or am I just kidding myself? Apologies I missed an April Fools posting this year. 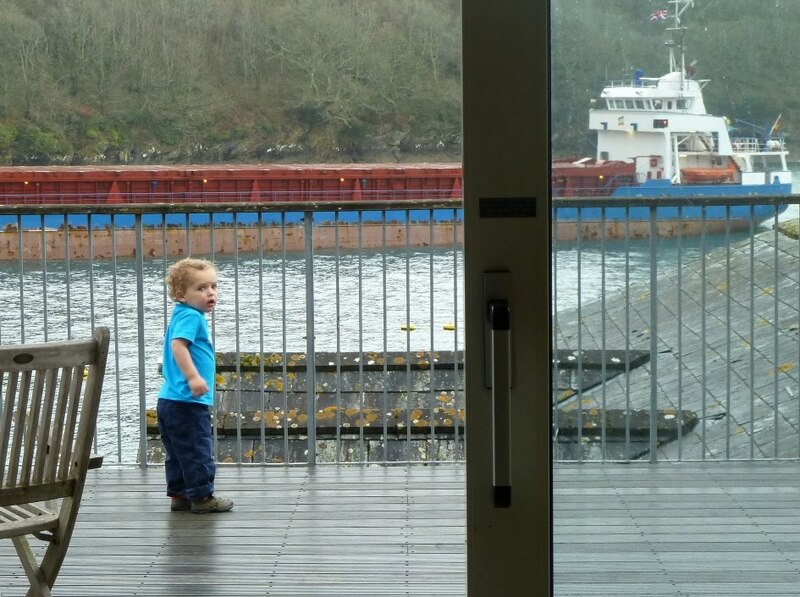 One of the nice things about where we stay in Fowey is looking out at the boats in the harbour, which is still very much a working port. 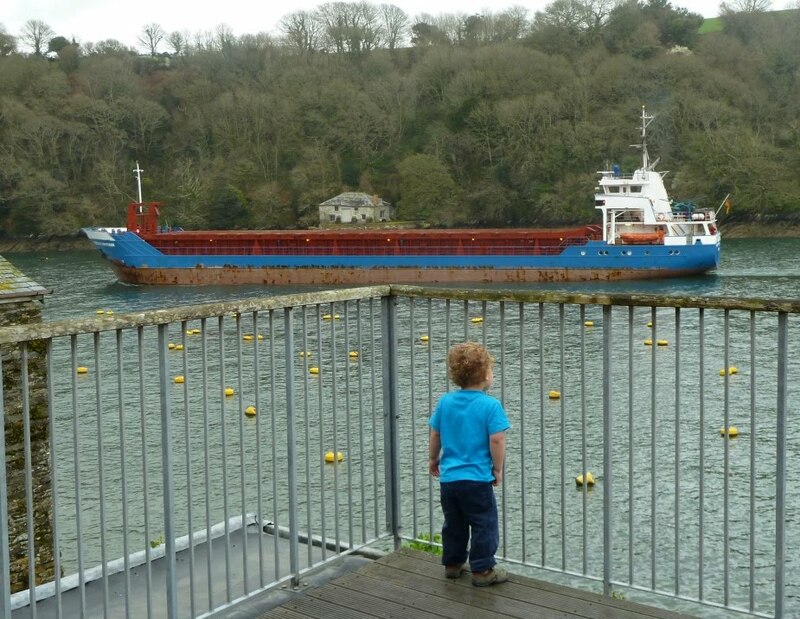 So you can imagine the excitement when one of the freighters which transport the local china clay came steaming past. 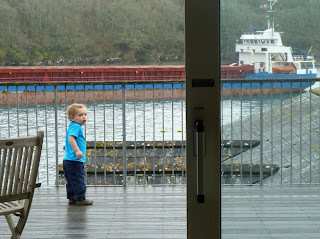 You can see the all moorings outside our decking, which doesn't leave an awful lot of river to navigate in. 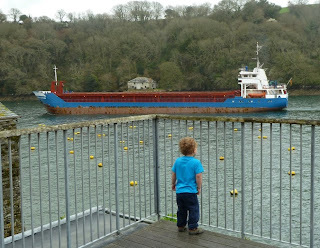 Not something which concerned Joe too much as he shrieked "Daddy, big boat, Daddy big boat!"